Angelonia - spikes of flowers and is a very useful plant. 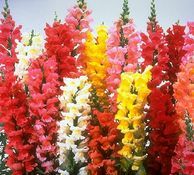 Sometimes known as Summer Snapdragon, as it will keep flowering as summer temperatures rise. Useful in containers or in the ground. We have found this to be a beautiful plant in window boxes. about 2 feet tall. Hawaii Blue - delivers all the positive attributes wanted, a nice compact habit, early flowering, and excellent performance in pots or in the garden. 6-8 inches tall with a spread of 8-10 inches. Full Sun - Part Shade. Super Olympia Red - A low growing plant perfect for edging or containers. This Begonia will tolerate full sun or part shade. 6-8 inches tall, 12 inches wide. 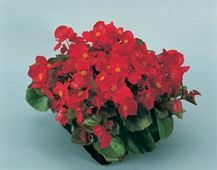 Big Red with Bronze leaf - the most vigorous, well-branched landscape begonia on the market. The BIG series are two weeks earlier than most competing varieties. 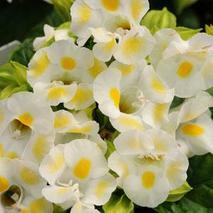 Feature large 3 inch showy flowers that are held above the foliage for maximum show. This beauty thrives in a wide range of climates and soils, can be planted in sun or shade. Many of you will remember we had these growing in our window boxes here at English Country Gardens from Spring through Fall 2012. 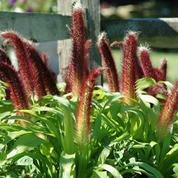 Dragon Wings Red - Vigorous and heat tolerant with abundant flowers all summer; great plant to fill open shady spaces. 14 - 18 inches tall, plant approximately 18 inches apart. We have Champion Blue and Champion Pink. Both sport 1 to 1 1/2 inch long upward facing flowers. Stems can be 24 - 30 inches tall. A wonderful addition to any cut flower garden. 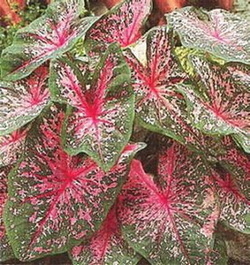 Grows well in full sun to part shade. 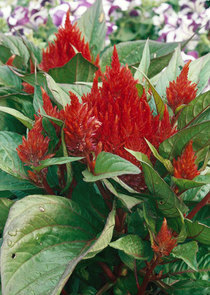 Fresh Look Red - Few flowers are as showy as celosia and the Fresh Look Red series is an excellent choice if you are looking for a stunning addition to your garden or for a new selection for your borders or containers. Striking upright spires that grow to 18 inches tall. Wonderful in bouquets and can be easily dried. Tender Perennial - Bleeding heart is a sprawling vine like shrub with evergreen leaves. The plant's stems can get 15 ft (5 m) long, climbing without tendrils, suckers or root hairs, but rather by twining through and around its support. The leaves are large, up to 7 inches long, and arranged opposite one another along the stems. Panicles 4 inches across. Red and white flowers are produced throughout summer. The individual flowers, a half inch wide, are bell shaped with white calyces and crimson red petals. As is typical of the glorybowers, the flowers have four stamens and a style (the elongated part of the pistil) that extends way beyond the petals. Kong Rose - An annual prized for its unusually wide leaves of gold and rich burgundy. Plant May through early summer. 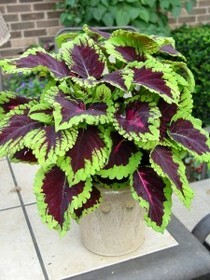 Superb container plant, ideally in shade or part shade. Showy enough to sand alone in a pot. 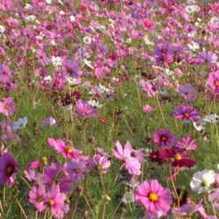 Also can be planted in the ground along a north or east foundation or in any shade garden. 12-15 inches tall and wide. Wizard series in several colors - Mid sized foliage plant with mounding upright habit great for mixed containers or landscape features. Keep in full to partial shade - full sun will cause the leaves to scorch. 12-14 inches tall and 10-12 inches wide. 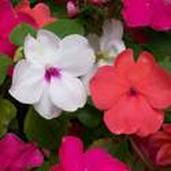 A mix of white, red, and pink flowers make a delightful sweetheart bouquet, container, or border. The Sonata series is prized for its abundance of 2 3/4 - 3 inch blooms that jocky for position atop very compact plants just 2 feet tall and 15 inches wide. Great size for front of the border, edging, or containers. Blooms all summer long. Grown primarily for its attractive silver-gray foliage rather than the yellow flower it produces. Most gardeners actually cut the flower off in order to encourage more leaf growth. 8-15 inches tall with a spread of 12-16 inches. 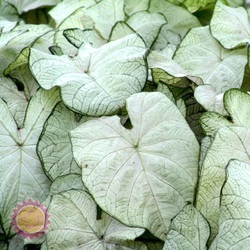 Excellent as border plants or to use in cut flower arrangements.Grow in full sun to develop that beautiful silver color. beautiful daisy like flowers on compact plants featuring green or silver leaves. 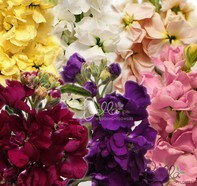 Flowers come in an assortment of colors with beautiful markings. A true sun worshiper, this lovely flower prefers full sun and will close its flower as the sun goes down or on cloudy days. 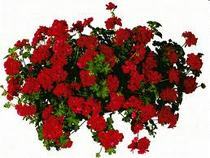 Geraniums come in a wide variety of colors, sizes, and flower types. Some varieties tolerate full sun better than others but all will benefit from sun to produce those abundant large flower heads. In particular the Ivy leaf varieties are particularly well suited to hanging baskets. Use Geraniums in pots, containers, borders, gardens, hanging baskets. Pinto Series - Pinto is a renowned series of seed geraniums famous for its big blooms on short stems and its vigorous growth. 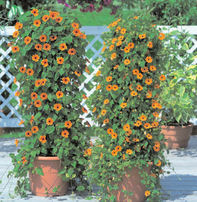 Sun loving bedding plant reaches anywhere from 10 - 24 inches high. Excellent for garden or container. 12 - 18 inch wide. Flowers hold up very well and need little deadheading. 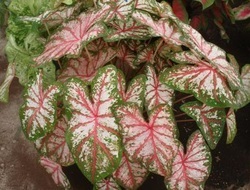 Splash Mix - Also called Polka Dot Plant - Green leaves heavily spattered with bright color highlights (White, Red, Pink). About 5" tall. 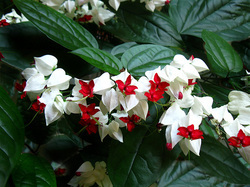 Another wonderful shade loving plant available in an abundance of colors and flower sizes. Lobelia is prized for window boxes, hanging baskets, planters, and ground cover. 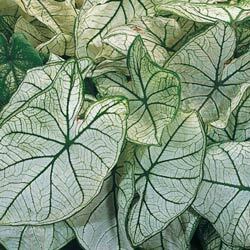 These plants will grow well in the hot Georgia sun if you provide them with partial shade and rich, moist, well drained soil. 3-9 inches tall and about 6 inch spread. 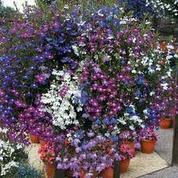 Lobelia come in a variety of colors including white, blue, lavender, mauve, and more. Marigold - you'd have to search hard to find a flower that would be easier to grow or more cheerful than the lovely marigold. These plants show a wealth of gold, copper, and brass into our summer and autumn gardens. The flower's popularity probably derives in part from its ability to bloom brightly all summer long. 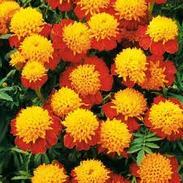 Marigolds have daisy-like or double, carnation-like flowerheads and are produced singly or in clusters. There re about 50 species of marigolds but manly we deal with two - African Marigolds are the tallest at 3 - 5 feet tall, French marigolds are somewhat smaller and more compact and have relatively demure flowers and usually grow from 6 inches to 2 feet tall. You will love these full sun flowers in a never ending range of yellows, oranges, oranges, and more. Taishan Marigold - Named for the Taishan Mountains in China, these dwarf African marigolds have shorter peduncles (that part of the stem directly below the bloom) and thicker stems which make then sturdier. Color is continuous with secondary blooms coming on even while the first bloom is still looking good. 10-12 inches tall. Janie Series - Janie is the earliest & most floriferous French Marigold we know. 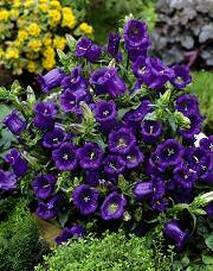 Neat blooms 1 1/2 - 1 3/4 inch wide drape the dwarf 8 inch plants. Both the blooms & the plant keep their neat shape despite hot weather. Very free blooming. Great choice for border, edging, & containers of all types. Safari Series - A French marigold. Robust, trouble free plants which branch vigorously. Finely divided dark green leaves - 4 inches long. More compact than African types. Blooms from early summer until frost. Single or double blooms, may be bi-colored. Smaller blooms than African types. Great for edging and containers. Long grass like leaves with feathery flower heads. Grows 36 - 48 inches tall need to be spaced about 9 - 12 inches apart. Fun to watch dancing in the wind. Petunias, doubles, singles, waves, easy waves, and more. These are sun loving plants available in a never ending range of colors. Excellent for beds, boxes, containers, baskets,and more. Full sun, 6 - 9 inches tall, spread depends upon variety. Also called mock rose, this is another full sun beauty with needle shaped foliage. Abundant color ranges available. 6 - 9 inches tall, low growing, easily spreading plants. Sundial Peppermint - Large double red and white blotched flowers remain open longer under lower light levels (typically portulaca flowers close at night and on cloudy days) Excellent ground cover and border plant for full sun, well drained areas. 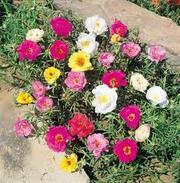 Heat and drought tolerant, the plants do not like excessively moist soil. An explosively blooming tender perennial. Topping out at around 12 inches tall this small upright grower is perfect for intense bright red color from May until frost in planting borders or large beddings of annual color. Keep this oone in full sun with well drained soil and it will give you its most intense and lasting color. 10 - 12 inches tall, about 8 inches wide. A partiular favorite of children who like to inch the tiny individual blossoms and make the "dragon mouth" open and close. Large, blossom-laden flower heads are faintly fragrant and come in a wide assortment of bright colors and heights. Full sun plants. Stocks have single or double flowers with a 1-inch diameter and a pleasing clove-like scent. The romantic beauty of this flower brings texture to garden designs, and its sweet, spicy fragrance is an added attraction. Colors range from white, cream, yellow, peach, lavender, pink, purple, and burgundy. Vase life is 5 - 8 days. Also called black-eyed susie - this wonderful sun loving annual vine shows in yellow with black eye or orange with black eye. You will love the way it quickly covers your trellis and blooms continuously from Spring through Summer. Thrives in full sun. Kauai Lemon Drop - Well branched plants are packed with bright, colorful blooms on compact 8 inch tall plants making this variety ideal for borders and containers. Tolerant of heat and humidity, they do best in moist soil and afternoon shade where summers are hot but will thrive in full sun in cool climates. Vigorously spreading, deep purple clusters from June to November. Excellent clean, deep green foliage with a trailing habit.10 - 12 inches tall, with a spread of 18 inches. 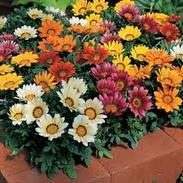 A reliable, drought-tolerant, sun plant available in a variety of colors. This plant will perform best in sunny dry spaces. 8 - 18 inches tall spreading 1 - 2 feet. Zinnias have bright, solitary, daisy-like flowerheads on a single, erect stem. Varieties vary in height from 8 inches to 3 feet tall. 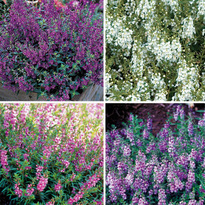 Use in annual or mixed borders. Smaller zinnias are well suited for edging, window boxes, or containers. Zahra Double Cherry - Perfect for dry, hot areas where water will be a problem in the long hot summer days. Exceptional disease tolerance. 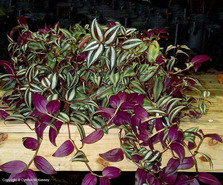 Very vigorous plants that are topped with deep magenta color, with lighter center as flowers age. Double blossoms. 16-20 inches tall, with a spread of 16-20 inches. 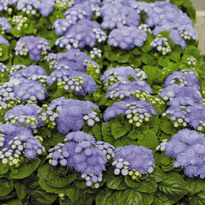 Profusion Series - This award winning plant is tolerant of mildew and other diseases. Drought tolerant, tough plant. 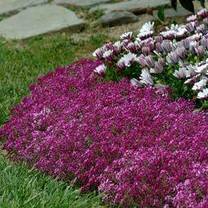 2 inch blooms create a solid carpet of color on super vigorous DWARF plants. 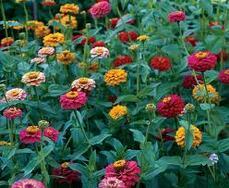 Zinnia Profusion remains the only choice for an extra early, extra long, extra colorful summer season of blooms. 12 - 15 inches tall, 12 - 15 inches spread.